European leaders gave debt-stricken Greece a final deadline of Sunday to reach a new bailout deal and avoid crashing out of the euro, after Greek voters rejected international creditors' plans in a weekend referendum. In the first step of its renewed bid for funding, Greece's leftist government must submit detailed reform plans by Thursday, EU President Donald Tusk said after eurozone leaders held an emergency summit with Greek Prime Minister Alexis Tsipras. All 28 European Union leaders will then examine the plans on Sunday in a make-or-break summit that will either save Greece's moribund economy or leave it to its fate. 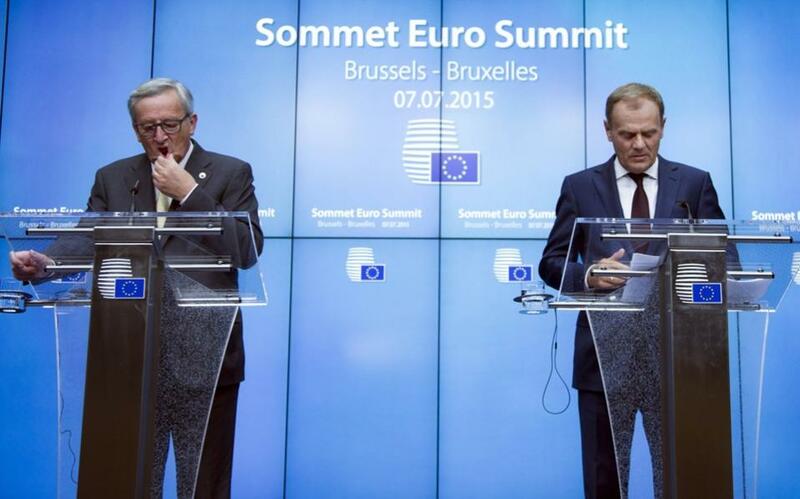 "Tonight I have to say loud and clear -- the final deadline ends this week," Tusk told a news conference. "Inability to find an agreement may lead to bankruptcy of Greece and insolvency of its banking system," he added. European Commission President Jean-Claude Juncker warned "we have a Grexit scenario prepared in detail" if Greece failed to reach a deal, although he insisted he wanted Athens to stay in the euro club. German Chancellor Angela Merkel meanwhile warned Greece would need a debt program lasting "several years" and insisted writing off any of Greece's 320-billion-euro ($350-billion) debt mountain was out of the question. The deadline came after Tsipras and his new finance minister Euclid Tsakalotos came to Brussels to discuss the fall-out from the dramatic referendum. Greeks voted by 61 percent to reject creditor demands for more austerity in return fresh EU-IMF bailout funds.